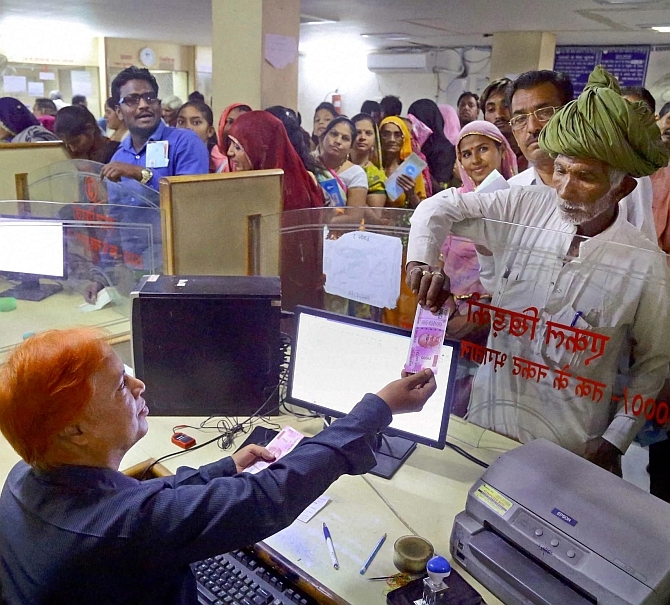 Rediff.com » Business » Demonetisation: It's a monumental disaster in the offing! During his investigation, he tracked down discrepancies in the policy and the subsequent statements by the government and the Reserve Bank of India. He posted his observations on his blog titled 'Decipher the Demonetisation'. With Wilson's kind permission, Rediff.com is sharing his views with our readers. The first of a two-part column"
High denomination notes of Rs 500 & Rs 1,000, which comprise 86.4 per cent of the total currency in circulation, ceased to be legal tender due to demonetisation policy announced on November 8. The Reserve Bank of India denotes these demonetised notes as 'Specified Bank Notes' or SBN. As per the RBI annual report 2015-2016, as on March 31, 2016, the value of the total SBN was Rs 14.18 lakh crore. Volume-wise it consists of 15,707 million Rs 500 notes and 6,326 million Rs 1,000 notes -- a total of 22,033 million notes (Rs 2,203.3 crore). Meanwhile, the total currency in circulation value-wise increased to Rs 17.975 lakh crore (November 4, 2016) from Rs 16.415 lakh crore (March 31, 2016). Exact information on the amount of SBN as on November 8, 2016 is now in the public domain, thanks to a query raised in the Rajya Sabha by Congress leaders T Subbarami Reddy and Ambika Soni. The government reply shows that 17,165 million pieces (Rs 1,716.5 crore) of Rs 500 (Rs 8.582 lakh crore) and 6,858 million (685.8 crore) pieces of Rs 1,000 (Rs 6.858 lakh crore) was in circulation (Total Value: Rs 15.44 lakh crore; total volume: 24,023 million [2402.3 crore] pieces). To print and replace 24,023 million notes is an enormous challenge considering the sheer volume of notes to be printed and capacity of our printing presses. So then how can the RBI achieve this target with resources at its disposal? 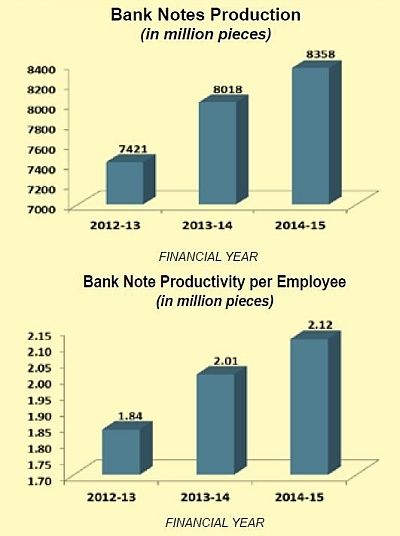 How much time will the RBI take to print and replace SBN with new notes? To understand this, in a pure resource management perspective, we have to examine the output capacity of our currency printing presses. India has four currency printing presses -- two under the Security Printing and Minting Corporation of India Limited at Nashik, Maharashtra and Dewas, Madhya Pradesh and two more under the Bharatiya Reserve Bank Note Mudran Private Limited in Mysore, Karnataka and Salboni, West Bengal. In terms of capacity of the units under SPMCIL, according to SPMCIL's annual report (see graphic), the Nashik press can print 5,800 million (580 crore) notes per year while the Dewas press can churn out 2,620 million pieces in the same period. BRBNMPL's Mysore and Salboni together can annually print 16,000 million (1,600 crore) notes in two shifts. So all these four presses together print 24,420 million (2,442 crore) currency notes in a year or 66.9 million (6.69 crore) a day. If we take Mysuru and Salboni alone, this will be 43.84 million (4.38 crore) a day. My next exercise was to understand whether we can outsource currency printing to any high-quality security presses abroad. 'The concerns and recommendations of the committee have been carefully noted for future guidance.' (Ministry of Finance, Department of Economic Affairs) (O.M No.3/8/09-SPMC dated 3rd January, 2013). So this assurance rules out the very question of outsourcing of the currency printing abroad. I do not think the RBI will violate an assurance given to Parliament's Committee of Public Undertakings. Hence, it has to depend on the four presses in our country to meet this enormous demand. In this context, we have to note that during the demonetisation exercise in 1977-1978 only less than 5 per cent of the high-value notes were demonetised. It is also important to note that the Rs 100 note, which was 50.1 per cent of the total currency in circulation was not demonetised during 1977-1978. Contrary to the above, this time the RBI and the government decided to demonetise the Rs 500 note, which consists of 47.8 percent of the value of the total currency in circulation. They also demonetised the Rs 1,000 notes thus making 86.4 per cent of value of total currency in circulation redundant, which choked and paralysed the entire cash-based economy with a whimsical direction overnight! Volume-wise, the quantity of Rs 1,000 note is at 6,858 million (685.8 crore). If all Rs 1,000 notes are converted to Rs 2,000 notes, keeping the same value, that volume will be halved to 3,429 million (342.9 crore) notes to facilitate quick printing and disposal. The RBI has to tweak the ratio between the Rs 500 and Rs 2,000 to provide easy change and mobility between these two notes. So obviously, there should be lesser volume of Rs 2,000 notes and higher volume of Rs 500 notes to keep the equilibrium of the system. For the time being, let us assume that the RBI has gone with a complete swap of Rs 1,000 with Rs 2,000 notes. Definitely, this is a short-shrift exercise without considering the much-needed mobility and velocity of the demand of these various denominations of currency notes in circulation. In that scenario too, the RBI has to print at least 20,594 million (2059.4 crore) notes (17,615 million of Rs 500 + 3,429 million of Rs 2000) in a short span of time. The elimination of Rs 1,000 note and introduction of Rs 2,000 note is really perplexing and the RBI's explanation has turned them a joke. One glance at an RBI study titled Modelling Currency Demand in India: An Empirical Study reveals how the central bank and the Union government all along resisted the issuing of high denomination notes even when warranted in a short time for inflation control, considering the chances that this high denomination currency will be used for hoarding purpose by the black money holders. So, it is ironic that the high value currency note of Rs 2,000, which has been introduced in the guise of controlling the hoarding of black money, at the end of the day, helps the hoarders in transporting and hoarding! This hasty and irrational decision was taken without considering the statistical principles of distribution of various denominations in the currency in circulation and also fully sidelining the prudent decision to eliminate the chances of hoarding. This short shrift route of going for the Rs 2,000 note without considering any of the above consequences into account and only taking the ease of printing, is a telling reflection of how an institution like the RBI let itself erode its independent stature to please the political masters! I discarded here the essential tweak required for maintaining the equilibrium between Rs 500 and Rs 2,000 notes, and also the increase of currency required to meet the demand of cash in the economy in the coming months till this disaster is mitigated. Many government sympathisers may definitely point out that the entire Rs 15.44 lakh crore of SBN will not return into the system and that there is no need to replace the entire currency. My opinion is that these two factors balance and neutralise each other. Hence for the time being, I decide to go ahead with the figure of 20,594 million new notes as our target for printing. In the initial days, the WhatsApp army was busy forwarding daring claims that only 50 per cent SBN would return into the system. Even our attorney general told the Supreme Court that the RBI and the government expected only a maximum of Rs 12 lakh crore of SBN to return to the system. Today, we hear media reports quoting the finance ministry that SBN worth around Rs 14 lakh crore has already returned to the system. Remember that we are still some days away from the date set by government to deposit the SBN at banks. So its time for the RBI and the government to eat humble pie. It is important to understand that the above cut-off date will not set free the RBI's responsibility to exchange the rest of the currency in circulation at their counters, it only limits the option of depositing/exchanging at banks. 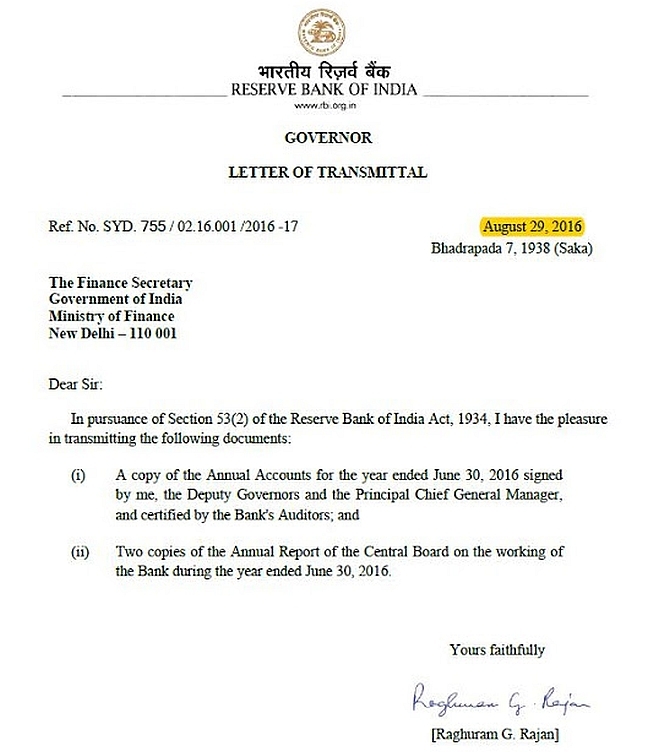 To understand the currency printing schedule, one needs to see the letter of transmittal dated August 29, 2016 of the RBI Annual Report 2015-16 signed by former RBI governor Raghuram Rajan. Note the date, it is very important. We know that the present Governor Urjit R Patel assumed office on September 4. Now look at Table VIII 4 in the same report (above) titled 'Indent and Supply of Bank Notes by BRBNMPL & SPMCIL". For the year 2016-17, the RBI has given an indent for 5,725 (572.5 crore) million Rs 500 notes & 2,200 million (220 crore) Rs 1,000 notes along with other lower denomination currency notes. If there was a plan in advance to demonetise these denominations, why then did the RBI print and disburse such large quantities of SBN into circulation? This is nothing but sheer wastage of exchequer's money. Moreover, if the RBI had such an advance plan to replace the above SBN, they should have devoted their time and energy to print lower denominations notes instead of SBN. Hence, it is beyond doubt that the entire demonetisation plan came into the picture after Urjit Patel took charge. The new denomination note of Rs 2,000 bears the signature of Governor Patel, not of Governor Rajan, which also another explicit evidence to prove that these notes were introduced after Governor Rajan left the RBI!